“The Apology is an important part of healing for Indigenous Australians. It acknowledged the significant trauma and grief suffered as a result of past policies, particularly the removal of children from their families. “However, the Close the Gap strategy has never been fully implemented. There has been a decrease in funding over the past five years to Aboriginal and Torres Strait Islander health services; the biggest impact has been to our members and affiliates. National Aboriginal Community Controlled Health Organisation (NACCHO) Chair, John Singer said the National Day of Apology takes on special significance this year as governments attempt to ‘refresh’ the Closing the Gap Strategy. ” Mortality for the indigenous population has flatlined since 2008 and the inevitable result is that mortality gaps are widening rather than closing. This is not surprising since the government’s own reports clearly show that preventable admissions for Indigenous people, funded by the States and territories, are three times as high as for the rest of the population yet, use of the main medical and pharmaceutical health schemes, MBS and PBS, funded by the Commonwealth, appears at best to be a half and a third respectively of the needs based requirements for Indigenous people. The Royal Australian College of General Practitioners (RACGP) and National Aboriginal Community Controlled Health Organisation (NACCHO) are calling for all levels of government to work with, not for Aboriginal and Torres Strait Islander people to reduce health disparity, after a recent report found the gap in life expectancy is widening. The Australian Institute of Health and Welfare report found the gap is widening due to accelerated increases in the non-Indigenous population. 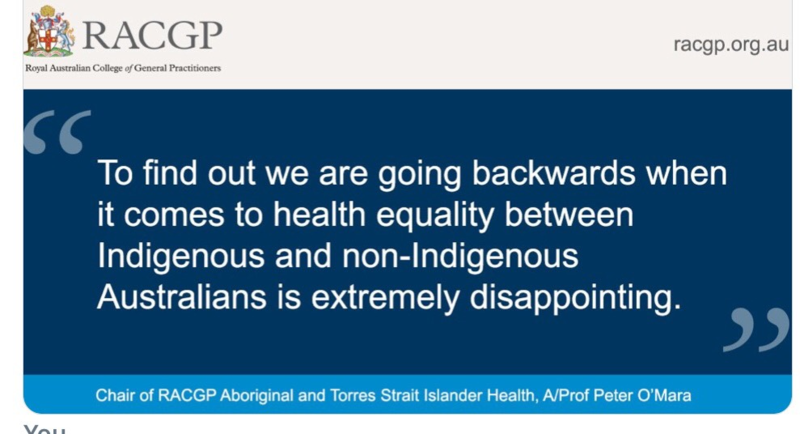 Chair of RACGP Aboriginal and Torres Strait Islander Health, Associate Professor Peter O’Mara said the increasing gap in life expectancy shows a disengagement from the national strategies to improve health equality for Aboriginal and Torres Strait Islander patients. A/Prof O’Mara said governments have committed to ‘working with, not to’ Aboriginal and Torres Strait Islander communities, but this commitment has not translated into meaningful engagement. “The lack of action in response to The Redfern Statement and Uluru Statement from the Heart reflect this failure,” A/Prof O’Mara said. The Close the Gap refresh being considered by the COAG provides an opportunity to reflect upon and reform current policy settings and institutionalised thinking,” Mr Singer said. 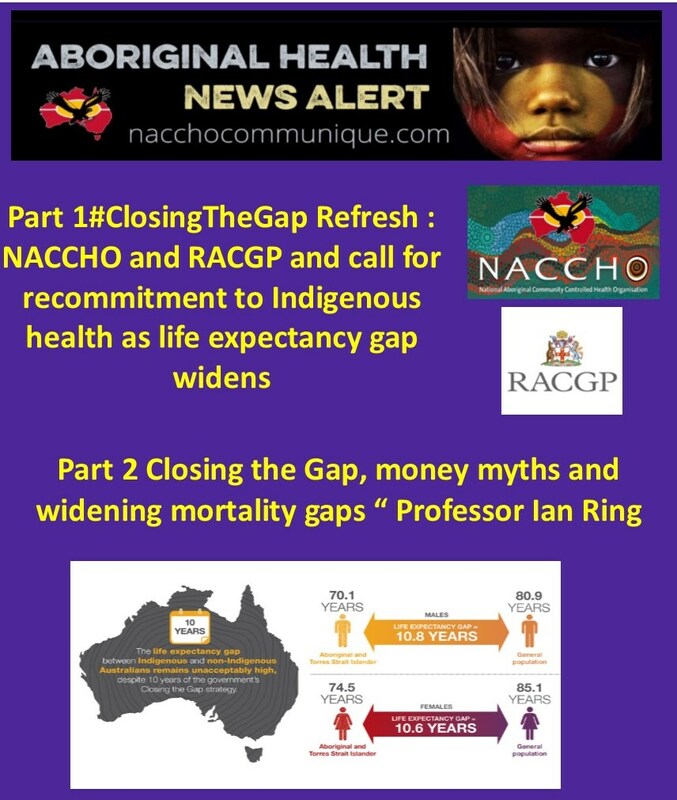 The RACGP and NACCHO are calling on the government to acknowledge the critical role of primary healthcare, particularly the culturally responsive care offered by Aboriginal Community Controlled Health Services, as it considered the Closing the Gap Strategy this year. “This will play a vital role in addressing health disparity and ensure we finally make progress,” A/Prof O’Mara said. 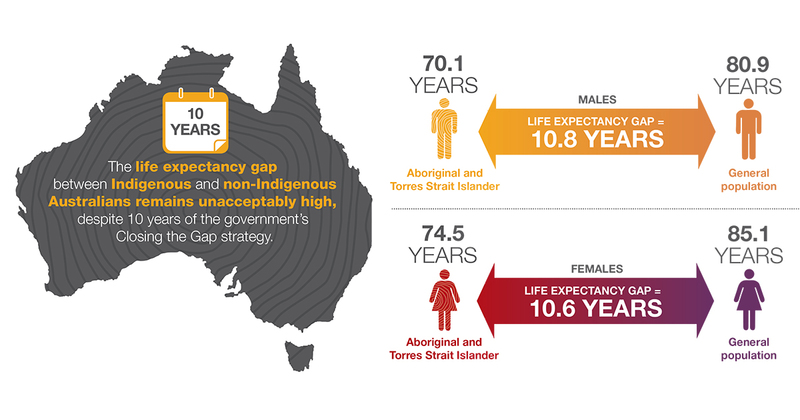 Ten years on from the start of Closing the gap, the mortality gaps are widening, and money myths play a role. The recent Productivity Commission Report found that per capita government spending on Aboriginal services was twice as high as for the rest of the population. But higher spending on Aboriginal people should hardly be a surprise. We are not surprised, for example, to find that per capita health spending on the elderly is higher than on the healthier young because the elderly have higher levels of illness. Nor is it a surprise for example, that welfare spending is higher for Indigenous people who lag considerably in education, employment and income and there would be something very wrong with the system if it were otherwise. The key question in understanding the relativities of expenditure on Indigenous is equity of total expenditure, both public and private, in relation to need, but the Productivity Commission’s brief is simply to report on public expenditure. But what of government expenditure on health services? The picture is quite different for State and Territory governments on the one hand which spend on average $2.0 per capita on Indigenous people for every $1 spent on the rest of the population. By contrast, the Commonwealth spends $1.2 for every $1 spent on the rest of the population, notwithstanding that, the burden of disease and illness for Indigenous Australians is 2.3 times the rate of the rest of the population. This is massive market failure. The health system serves the needs of the bulk of the population very well but the health system has failed to meet the needs of the Indigenous population. Mortality for the indigenous population has flatlined since 2008 and the inevitable result is that mortality gaps are widening rather than closing. And yet it is within the grasp of the current government to turn things around. It has been shown that the nonviolent death rate for Aboriginal people can be halved in just over three years by systematic application of knowledge we already have. But it has also been shown that there are no short cuts and these beneficial results require high quality services and these individual examples of success must become the norm. So, what needs to be done? A key requirement is Commonwealth seed funding for the provision of satellite and outreach Aboriginal Community Controlled Health Services (ACCHS) that Indigenous people will access, and which provide the comprehensive services needed to fill the service gaps, boost use of MBS and PBS services to more equitable levels, and reduce preventable admissions and deaths. Much more attention needs to be paid to the quality of services, with much needed investment in the training of clinicians, managers and public servants for the difficult and complex roles they have to play. Additional funding is also required for mental health and social and emotional wellbeing services which were neglected in the Closing the Gap initiatives. On the broader front, culture, racism and social, political and economic issues also cry out for attention. \It is not that the Commonwealth is deliberately underfunding health services for Aboriginal and Torres Strait Island people but there are decades of experience establishing beyond all doubt, that demand driven services designed to meet the needs of the bulk of the population, will not adequately meet the needs of a very small minority of the population with very special needs. of those services is patchy and needs to be expanded. There is little point in having mortality goals which are clearly in jeopardy, when the causes are not hard to define and the remedies clear, if there is insufficient action taken to actually achieve the Goals. The funds required for such services, together with the others described above, spread over a carefully prepared 5-year plan are likely to be modest, and would make a real and substantial improvement to the health of Indigenous people. There is no call for some kind of special deal, but simply the same level of expenditure by both Commonwealth and State governments for Australia’s Indigenous peoples that anyone else in the population with equivalent need would receive.